1. What is the name of this robot? 2. 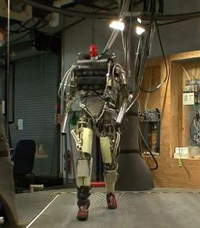 __________________ The U.S. military will use the robot pictured above to carry heavy loads through rough terrains. 4. __________________ The statue to be placed near ground zero will have a piece of steel from the World Trade Center embedded in its base. 5. __________________ In its most recent report on Iran’s nuclear program, the U.N.’s nuclear watchdog agency for the first time said that Iran is suspected of attempting to build nuclear weapons. 7. __________________ A bill introduced in the Senate on Wednesday regarding online sales tax would permit state governments to collect sales tax on goods purchased online. 8. Supporters of the online sales tax bill include all but which one? 10. __________________ Veterans Day was called Armistice Day until 1954 because November 11th was originally a day set aside to honor veterans of WWI, who had ceased fighting on the 11th day of the 11th month in 1918.